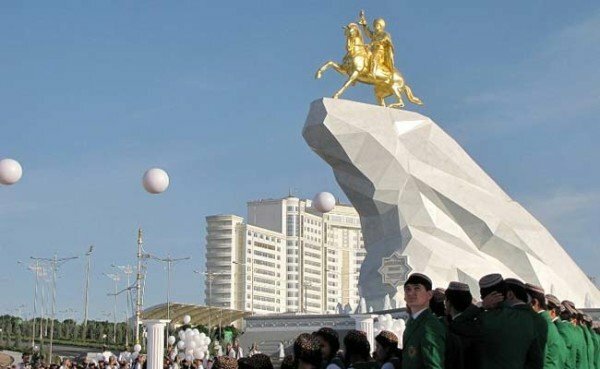 Turkmenistan’s President Gurbanguly Berdymukhamedov has been honored with a huge monument in the capital city, Ashgabat, featuring his likeness atop a golden horse. The Turkmen leader is galloping ahead in race to construct a cult of personality bigger than his predecessor’s, the late dictator Saparmurat Niyazov. Cast in bronze and covered in 24-carat gold leaf, the statue of Gurbanguly Berdymukhamedov soars 70 ft from the ground and is perched on an outcrop of white marble cliff. Gurbanguly Berdymukhamedov, who has run Turkmenistan since 2006 and is accused of presiding over one of the most pervasive personality cults in the world, is widely known as Arkadag, or the patron. The composition was unveiled in Ashgabat on May 25, to cheers of “Glory to Arkadag!” from assembled students, as white doves and balloons were released into the sky, Reuters reported. Officially, the monument was commissioned after public clamor. Gurbanguly Berdymukhamedov’s image is ubiquitous in Turkmenistan, with huge portraits adorning billboards and buildings across the country. The gold statue, however, recalls the reign of his predecessor, Saparmurat Niyazov, who was known as Turkmenbashi, or leader of all the Turkmens. Saparmurat Niyazov ensured that gas-rich Turkmenistan remained one of the most isolated countries in the world, ensuring no free media, allowing little foreign travel and enacting a series of decrees that renamed the days of the week and months of the year after himself and members of his family. Hospitals outside the capital were closed, opera and the circus were both banned, and all schools and universities had mandatory classes for studying the Ruhnama, Saparmurat Niyazov’s book. His ministers were forced to perform a gruelling annual “walk of health” through the capital. The dictator travelled by helicopter and met them at the finishing line. Gurbanguly Berdymukhamedov, who was formerly a dentist and then became Saparmurat Niyazov’s health minister, presided over a very gradual liberalization when he first came to power after Niyazov’s death, reversing some of the late president’s more eccentric decrees. In time, however, Gurbanguly Berdymukhamedov built up a personality cult that now rivals that of his predecessor. Saparmurat Niyazov famously had a gold statue of himself erected in the centre of Ashgabat that rotated to face the sun throughout the day. When Gurbanguly Berdymukhamedov took over, the monument was moved to the outskirts of the city.